I am sure like my family you are knee deep in Christmas activities and plans, especially ones that will create special memories for you and your family! As my kids grow up, it seems like it is more of a challenge to come up with new ideas or which all ones to keep that bring to life the true meaning of Christ’s coming. Do you have one that you can share with us? Today, I am sharing one of my favorite Christmas memories over at my friend Karen Ehman’s blog. 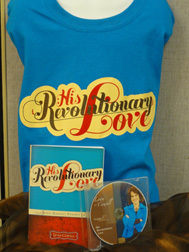 I’m also giving away a “Revolutionary Love” bundle: an autographed book, t-shirt and CD. Take a moment to pop over to Karen’s at www.KarenEhman.com and share some Christmas cheer! Hopefully you’ll win this bundle for the teen girl in your life. « My Good or His Best?